I got my visa. Believe it or not. All this excitement, for a sticker and a stamp. "So how was it?" you will ask. "An interesting experience," I'd answer, my gentle reader. Then I'd shake my head and be silent for a while. Okay, okay, I won't be silent. Not much of a silent type. So let me tell you from the beginning. After I got the notification that my new visa was approved, I had to have a visa interview at a US consulate somewhere (and consulates can rarely be found within their own country's borders) in order to have the new visa stamped in my passport. I picked Canada. Now you can't just cruise up at a consulate at any time, you have to have an appointment first. And you will get the appointment by calling a 1-900 number (yepp, 900) operated by a commercial contractor, at which point they will give you a special secret decoder case number with which you can then log into a secret web site operated by the same contractor, and schedule an appointment online. Or you could call 900 number and schedule an appointment by phone. The first time I called them, there were no appointments in any of the consular offices in Canada. So I thought, I'll start checking the website each morning and see if something shows up. You see, each office would make appointments available for scheduling six or eight weeks ahead. Each day, the schedule would advance one day. So theoretically, each day you would have a chance to pick an appointment. It took me full four months, checking for appointments online several times a week and towards the end multiple times each day -- and I was not able to schedule anything. All calendars were always full. So in the end I grew desperate and called the 900 number, and they had one appointment available. One. I grabbed it. And that's why I was going to the snowed-in Ottawa earlier this week. The appointment itself was at 8:30 a.m. -- and remembering my last appointment experience in Frankfurt two years ago, I showed up at the gate at a quarter to eight, and was promptly turned around. 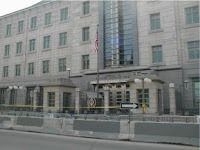 Apparently, the security procedure which was not followed by Frankfurt consulate was enforced in Ottawa. I went to sit in my car. Half an hour later, I was at the gate again, and was let in. I guess "let in" is an understatement. First, I had to present all the paperwork to the guard at the gate (in a -6 C cold), after which I was allowed through a metal detector (still outdoors) and into a glass-enclosed area with power-operated doors where I could wait for another security guard to let me into the screening area. Once admitted to the screening area, I had to take off my heavy winter jacket, my other jacket, worn underneath, was allowed to keep my shoes on (! ), but had to surrender all the paperwork to the guard for the time I was screened. After I had all my things back, including the snacks I brought (why weren't they confiscated? ), I proceeded to a clerk who checked my papers one more time, and said that the visa application fee I had arranged to be deposited in the Embassy's account was not enough, and I had to go on to the cashier and pay additional 31 dollars. What fee you say? Well, in order to attend your visa interview, you have to pay the "application fee" of 100 USD, and the only option they give you for payment is a deposit at a branch office of Scociabank. Since there are none of these within the confines of North Carolina, I had to ask someone I know through work to deposit the money for me in Canada, on the condition I'll pay it back to her once I am in the country. So I paid the thirty-one bucks and proceeded to wait. And wait. 8:30 a.m. came and went and I was still waiting. At about 9 a.m. I was called up to a window and fingerprinted. Then I waited again. Good I brought a book. Helped me keep my mind off screaming children who liked the wait about as much as I did, but were more vocal about it. Their mothers probably followed the "no food or drink" rule, so the kids weren't getting any happier by the minute. Then at about 10 a.m. I was called to another window, and after a very short interview it was all over and I was told to come back on Friday 3 p.m. to pick up my passport. It snowed again on Friday -- all morning and all afternoon, so by noon it was clear if I wanted to get to the embassy by three, I had to get moving soon. I left at about one, and got to an underground parking lot close by the embassy at about two. One hour for a drive that would have taken a quarter that time under regular conditions! I waded through the snow (by then at least 30 cm / 1 ft of it) to the front gate of the embassy. And was turned around again (a Pavlov's dog would have learned not to be early by now). Apparently, at three p.m. sharp, a guy would come out and give everyone their passports. Right there, in the snow. I had some tea at a Japanese restaurant and read, and walked back to the front gate. There were about a dozen people freezing in the wind and the snow at the gate. I got in the line and turned my back to the wind. The "guy" was late. I know, five minutes would not be bad in most cases, unless you're late to meet the Queen, but in the -12 C cold, with high winds deflecting off the menacing gray facade of the Embassy and hitting us seemingly from all angles, with snow everywhere, five minutes felt somewhat long. The "guy" materialized, and turned out to be an unseasonably lightly dressed woman and an armed guard, and the two proceeded to hand out passports to the waiting applicants. Five more minutes, and I was on the way back to the car and to the airport, with a fresh visa sticker in my passport. i just have to say - often i wish the citizens had to work as hard to be in this country as the aliens. we'd sure lose a lot of whiners.